Buying puff pastry from the store and straight into the oven is both practical and convenient, but there’s something magical about being able to create your own dough and pastry. The transformation of raw, simple ingredients into a lovely puff pastry usually does the trick. But if you’re not convinced, why not try our super easy recipe below? You’ll find yourself making your own puff pastry out of habit soon enough! In a large bowl, sift flour and salt. Chill the bowl in the fridge - this helps create better layers of the pastry later. While chilling the flour mixture, cut the butter to form smaller cubes. Stir the butter into the flour using a round-bladed knife. Make sure that each butter cube is coated well with flour. Work the mixture quickly to create a rough dough. Transfer the dough from the bowl to your work surface. Without kneading, squash the dough into a flat sausage. After chilling, flour both the pastry and work surface. Roll the pastry in one direction until it's around the size of a 15x15 cm block. Make sure its corners are square and even. Flip the dough to make its open edge face towards the right (like you would turn a book). 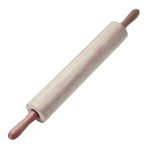 With a rolling pin, press the pastry's edges together. Fold and roll out the pastry again for four times to make sure that it is smoothened out. Buttery streaks are okay every now and then. Before using, chill the pastry overnight - or for at least a whole hour if you're pressed for time. When using the pastry, roll it out to the thickness of a coin. Cook at 200C for 30 minutes. Serve your puff pastry with jams, cheese, mushrooms, apples or on its own!